My hunt for a ferret companion began several weeks back. I decided it was time to introduce Harper, my first, and original cinnamon fuzzy to a new friend. After weeks, and what felt like hundreds of emails and calls to other fuzzy parents looking to rehome their babies on Craigslist, I was finally fed up with the lack of responses, and posted my own ad. Within minutes, I had responses. Not 5 minutes after agreeing to adopt a little boy for a $50 rehoming fee, I received a call about another fuzzy. The man calling told me the situation. He told me he found this little guy outside his apartment... Now, mind you it's the end of November, and quite cold. Only god knows how long he was outside. This man said he didn't know how to care for ferrets and his cat wasn't too fond of the fuzzy. We agreed on no adoption fee, and I picked up Leo later that day. I was not expecting what happened. I walked into this guys apartment, to find Leo asleep under a pillow. Sadly, he was more than just sleepy. The poor guy was half dead or worse. I picked him up, and he kinda just flopped. He was still breathing, but hardly. I inspected him, and held him for several moments, hoping he was just taking a while to wake up. He was unresponsive still, and I discovered plenty of fleas (which was expected to some degree) I offered him fuzzy food, treats, a french fry, and a burger corner. He refuted all options. Not a good sign at all. My fiance drove us to the vet. They had previously said they couldn't fit Leo in until 2:30 in the afternoon. It was only noon, and my new fuzzy was very bad off. My mom met us at the vet office. (She is a saint in animal rescue) It was a miracle that they could fit us in. The doctor was running late to lunch, and he saw Leo asap. 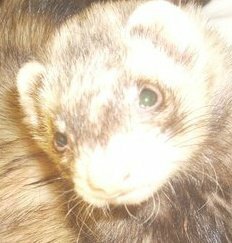 An otherwise healthy ferret, Leo was just run down, dehydrated, underweight, covered in fleas, and starving. With some TLC, the vet said he should recover. He was injected with liquid and nutrients, and force fed some watered down AD canned food. The vet also gave him a half dose of Feline Advantage to fix his flea infestation. We were told to hand feed him at least 3 cc's of AD every two or three hours. Its been four days now, and Leo is making a swift recovery. He gobbles down AD, and hard pellets, and has been drinking great deals of water. He is active, alert and loves to be out. As for Harper and him, she's not too please yet. But I'm sure things will smooth out between them.